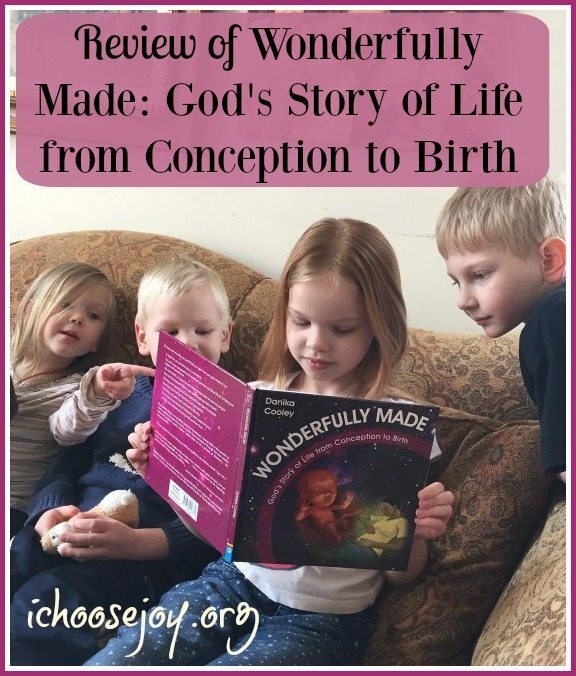 I’d love to share a review with you today of the children’s book by Danika Cooley called Wonderfully Made: God’s Story of Life from Conception to Birth . It’s really the best children’s book explaining conception to birth that I’ve seen! What I love about this book is that you can read it to your children to help them understand where they came from and how special they are. They learn about all the neat things that happened to them in their development in the womb. You can read it to your child simply to teach them about how babies develop in the womb, or it’s also a great idea to read it when you are pregnant with a younger sibling! Two really wonderful parts of the book are that it is filled with Scripture and that it shares the gospel message by explaining about being “born again”–the story of Nicodemus. She also has some other nice freebies and a great Bible curriculum!